You’ve probably heard of Nest thermostats, but the thought of installing a smart thermostat may be intimidating. Forget your fears because setting up most WiFi thermostats isn’t too complicated with our smart thermostat comparison. Many utility companies offer rebates for energy-saving thermostats. Smart thermostats usually pay for themselves within a few years with the savings on your monthly bill. You can find whatever features you are looking for in our best smart thermostat comparison. 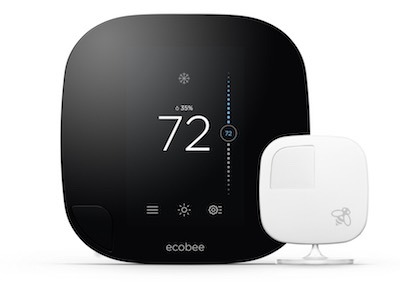 Customize the highly-accurate Ecobee3 smart thermostat with sensors throughout your home, or install a minimalist Nest WiFi thermostat for a simple, less complicated piece of hardware. Disclosure: All reviews and prices on this page are from Amazon.com. We use the Amazon API to display prices and reviews. Installation is basically hooking in a few wires. Label your thermostat’s wires, remove the current thermostat, and install the wires into the new smart thermostat. If you’re still not a fan of DIY installation, check out the Amazon links below for finding a professional installer on each product page. Once everything is plugged in, that’s where the fun starts. Control the temperature with the colorful wall control or your smartphone app. Set up alerts for air filter changes and extreme temperatures. Monitor the indoor/outdoor temperatures and humidity levels. Choose color schemes that match the tone of your home. Automatically use less energy when you are away from your home as these smart thermostats learn your home and away schedule. Adding a smart thermostat adds convenience. Check out our article analyzing if Nest is worth it to see some examples of how it can improve your life. This will also help you decide what smart thermostat you should buy. Our best smart thermostat comparison only includes the highest rated products on Amazon; because why waste your time with anything else? We’ll try to keep this best smart thermostat comparison accurate, but as new smart thermostats hit the market and software updates, let us know if you have any suggestions for our comparison chart.